C1406. 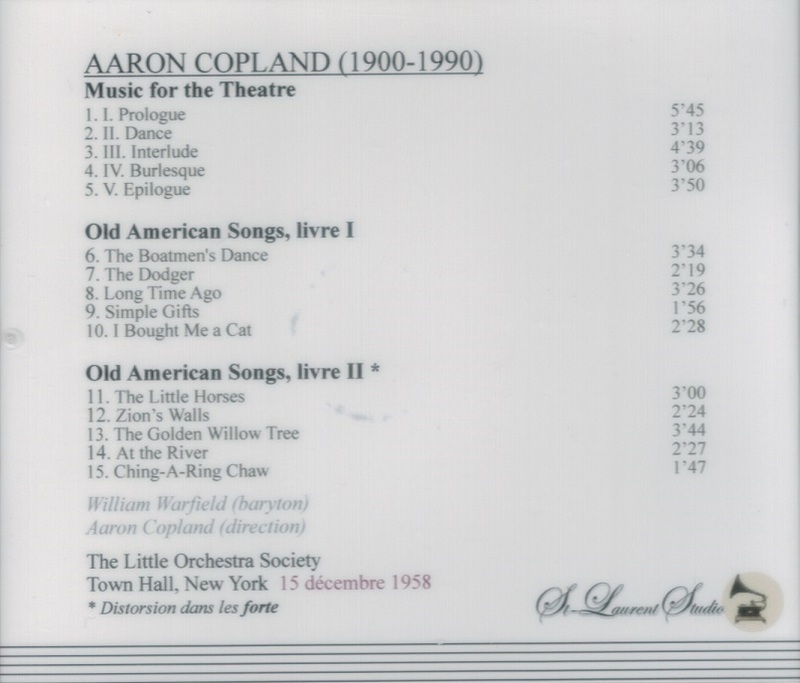 AMERICAN RARITIES: AARON COPLAND Cond. 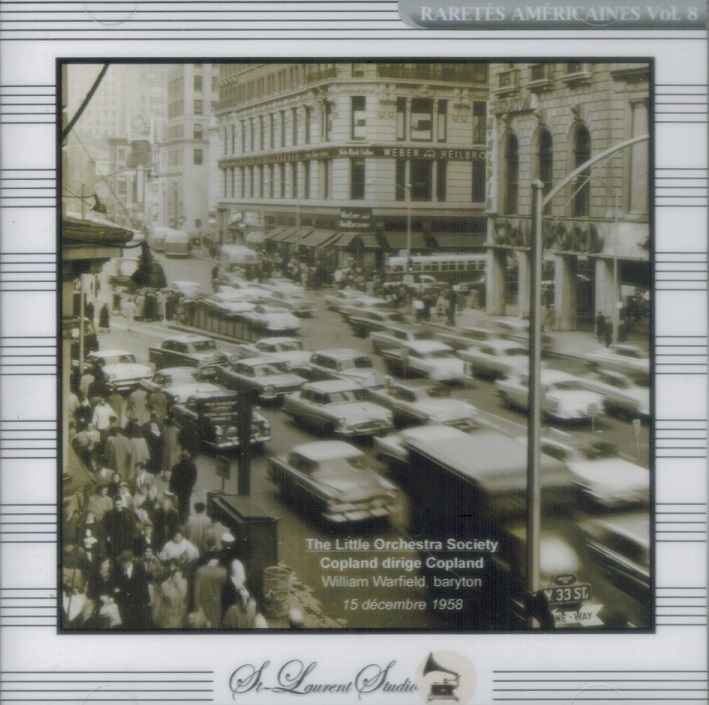 Little Orchestra Society: Music for the Theatre; w.WILLIAM WARFIELD (Bar. ): Old American Songs, Books I & II (all Cond. by the COMPOSER). (Canada) St Laurent Studio YSL T-319, Live Performance, 15 Dec., 1958, Town Hall, New York. [Never previously issued.] Transfers by Yves St Laurent. 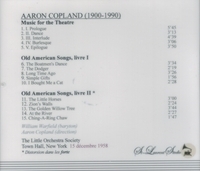 The subject matter for Copland’s songs was drawn from several places, not all uniquely American—politics, religion, children, love and loss, death, and the minstrel stage. ‘Zion’s Walls' is a revivalist tune with words and music by John G. McCurry (1821 -1886), a farmer from Georgia who published the song collection, THE SOCIAL HARP. Copland used this song again in his opera, THE TENDER LAND (1952-1954). Copland’s orchestration alternates between various instruments playing the tune with the singer and descant instrumental accompaniment, sometimes using both in one phrase. When searching for songs to set for his OLD AMERICAN SONGS Copland scoured the Brown University Library, specifically the Harris Collection, in search of interesting material. By the time the OLD AMERICAN SONGS were written, much of America’s innocence was beginning to fade. The cold war was raging and Copland found this environment ‘stifling' to his compositional process. The simplicity of these ten songs, coupled with Copland’s sensitive treatment of them, seems to point to the composer’s desire to return to a less complicated period in time." "Copland...has never turned out bad work nor worked without an inspiration. His stance is that not only of a professional but also of an artist - responsible, prepared, giving of his best. And if that best is also the best we have, there is every reason to be thankful for its straightforward employment of high gifts. Also, of course, for what is the result of exactly that, 'this simple and great man in our midst'." “William Warfield’s voice was deep, powerful and supple, and he invested all his work, whether folk songs, German art songs or Bach cantatas, with a combination of elegance and warmth that were his trademark. Still, no role was more central to his repertory than Porgy, which he sang all over the world, starting with legendary performances at the New York City Opera in the 1950s. When he returned to New York to sing Porgy at City Opera in 1961, Howard Taubman wrote in THE NEW YORK TIMES that Mr. Warfield's performance ‘has dignity and humility, and his singing has the kind of nuance, control and potency one rarely encounters in the Broadway theater'. A 1963 album of selections from PORGY AND BESS with the soprano Leontyne Price (they were married in 1952 and later divorced) was one of his most highly regarded recordings. A performance of Aaron Copland's OlD AMERICAN SONGS, with the composer conducting, has also remained an enduring favorite. In the late 1930's Warfield won first prize in the National Music Educators League Competition in St. Louis, which brought him a scholarship to the Eastman School of Music, in Rochester. His original goal was to become a music teacher, partly because he did not have great confidence that a black singer could make a career in concert halls and opera. But some of the few who had, among them Marian Anderson and Paul Robeson, encouraged him to consider the stage his goal, and on their advice, he focused more on vocal and dramatic studies than on teaching. Mr. Warfield's earliest professional engagements were in a production of Marc Blitzstein's Broadway opera, REGINA, and in several musicals, including a touring production of CALL ME MISTER. His breakthrough, though, came on 19 March, 1950, when he made his recital début at Town Hall. The performance, and the enthusiastic reviews that followed, created several immediate opportunities for Mr. Warfield, including a tour of Australia and a contract with MGM to play Joe in SHOWBOAT, reprising a role that one of his heroes, Paul Robeson, had sung in the 1936 filmed version of the work. In 1952 Mr. Warfield undertook a long tour of PORGY AND BESS that included performances in Dallas, Chicago, Pittsburgh and Washington, as well as at the Staatsoper in Vienna and halls in Berlin and London. He also made recital débuts in Vienna and Berlin during the tour, but what made the biggest headlines at the time was his marriage - the day before the cast left for Europe - to his co-star, Ms. Price. The wedding took place at the Abyssinian Baptist Church, in Harlem, with the entire cast of PORGY AND BESS in attendance. The couple separated six years later and divorced in 1972, but they remained on friendly terms and continued to collaborate. Like many singers, Mr. Warfield turned increasingly to teaching after the prime years of his stage career. He became a professor of music at the University of Illinois at Champaign-Urbana in 1975, and he joined the faculty of Northwestern University in 1994. But he continued to perform. In 1989 he began touring with the Jim Cullum Jazz Band, narrating the ensemble's concert version of PORGY AND BESS, and in the mid-1990s he performed in a staging of SHOWBOAT. He was scheduled to sing at Carnegie Hall [in 2003]." “With scores like APPALACHIAN SPRING, RODEO, LINCOLN PORTRAIT, and FANFARE FOR THE COMMON MAN now subsumed into the bedrock of the American consciousness, Copland’s iconic status as musical elder statesman is secure - each new exposure to Copland’s music is a reminder of how direct, apt and powerful it remains."